label of W. Freeman & Son: ‘W.F.& S. No.124 / “Tidy up” / 7/6/7/E’. 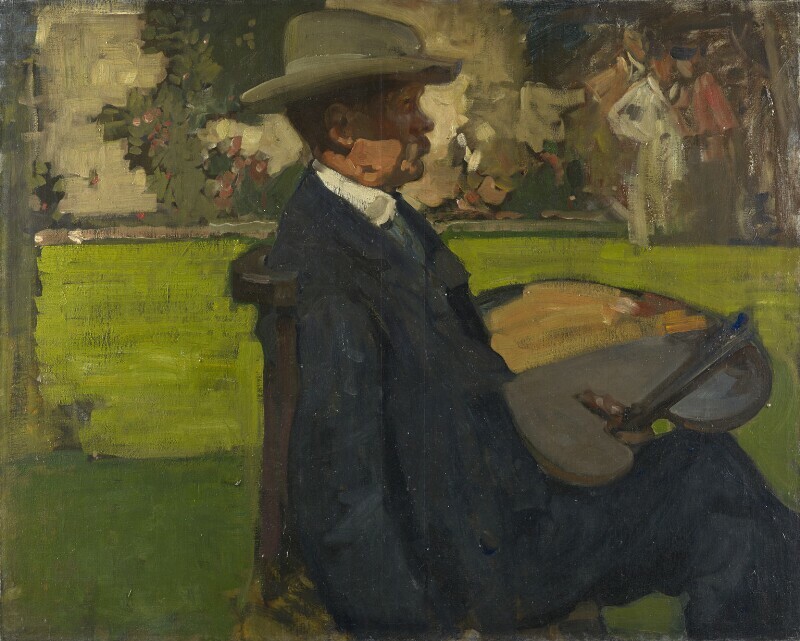 Brangwyn was not habitually a portraitist; NPG 4826 is undated but displays his technique of the early 1900s and may date to one of the Brangwyns’ visits to St Ives. ‘In January 1904 Frank and Lucy Brangwyn were staying with Alfred East at his house in St Ives (a house where they were regular guests until about 1909) when it was announced that Brangwyn had been elected an associate member of the Royal Academy.’ The bold almost abstract brushwork, thick and oily, captures a characteristic profile in strong contrasts of light. East later bequeathed the painting to his eldest daughter Mrs Donald. A photograph recording the outdoor sitting is in a private collection. In the painting a group of three figures in the top right-hand corner observe Brangwyn paint East painting in a garden. Many years later, in about 1943, Brangwyn made a pen and ink sketch after the photograph and inscribed it ‘FB painting Alfred East in the garden’. 1) ‘In my opinion Brangwyn is the Rembrandt of tomorrow’: East to reporter, cited Brangwyn 1978, p.90. 2) For 1896 Spanish subjects by Brangwyn in East’s collection, see Shaw-Sparrow 1910, pp.228–9. 4) Brangwyn 1978, p.90. The reference is to St Ives in Cambridgeshire. 5) Horner 2006, no.87 (ill. p.12). The photograph is unseen; the sketch was for sale at £900 in 2006. Life-size, three-quarter-length, seated to right in straight-backed seat, profile with hat, against a garden background, group of three figures in top-right corner. Mrs Donald (sitter’s daughter) until 1957; purchased from Mr E.H. Glaisyer, 1970. Artists at Work, NPG travelling exhibition, Plymouth City Museum & Art Gallery, 1981; Wolverhampton Art Gallery & Museum, 1981–2; Ferens Art Gallery, Hull, 1982; Harris Museum & Art Gallery, Preston, 1982; NPG, London, 1982 (18).